With less than 30 games left in the regular season, the A's find themselves 2 1/2 games behind the Astros for first place in the AL West, and 5 1/2 games ahead of the Mariners for the second AL Wild Card spot. As the race for the division title hits the final stretch, we take a look at each team's remaining schedule. Even though the A's trail the Astros by just 2 1/2 games, it will be extremely difficult to catch them for the division title. Houston plays 20 of its final 29 games against sub-.500 opponents, and six of its nine games against plus-.500 teams are at home. The A's, on the other hand, still have to play 13 games against teams over .500. 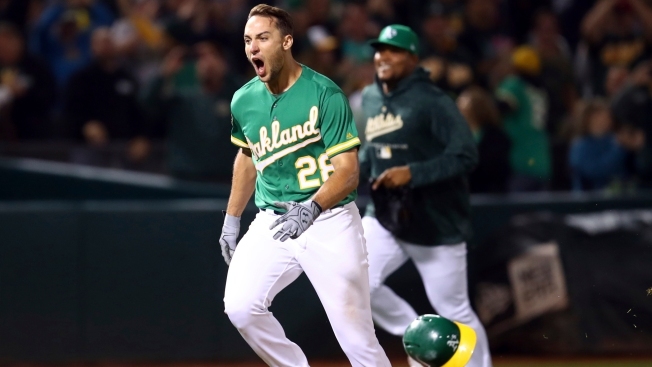 The teams' health statuses are also heading in opposite directions, with the Astros getting back to full strength, and the A's losing starting pitchers Sean Manaea and Brett Anderson to injury. Since José Altuve returned to the Astros lineup, they have gone 7-1, outscoring opponents 52-28. With the Mariners coming to Oakland Thursday for a four-game series, the A's have a chance to all but put away Seattle. If Oakland takes three of four, the Mariners would fall 7 1/2 games back in the wild card race with less than a month to play. Even a series split would maintain the A's 5 1/2 game cushion. Oakland does still have to make one more trip to Seattle for a three-game series in late September, but it feels like the Mariners have to win at least three of four this weekend to have a realistic shot.